Amazingly enough, this dream has come true. The Fête has turned into a true national holiday: Paris shuts down on the summer solstice and musicians take over. Three decades later, the holiday has spread throughout the world and is now celebrated in more than 800 cities, towns and villages in 120 different countries. In 2015, Mike Risko Music registered Ossining/Briarcliff to be part of the international celebration. Ossining/Briarcliff is the first and only community in Westchester to celebrate this growing event. The event in our community has grown to not only include a celebration on the summer solstice, but also the winter solstice. Says Mike Risko, "We were excited at the idea of musicians taking over and we also want to give back to the community that supports us in all our musical endeavors. What better way to give back than to organize a tremendous music festival like Make Music Day." Each year, Make Music Ossining Briarcliff features over 25 locations/musical acts all over the community and it is growing! The winter 2018 event was the biggest one thus far. "It is so nice to drive around the community and see people gathering on the shortest and darkest day of the year to share music. This event started much smaller with just local restaurants hosting musicians. 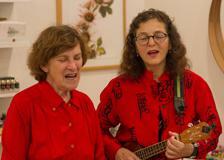 We have featured musicians in real estate offices, pharmacies and village hall. We look forward to seeing what kind of venue will pop up next!" 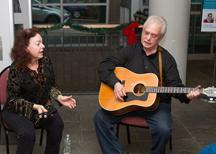 The Make Music Ossining Briarcliff Committee not only encourages people to get out and enjoy some of the live music that is scheduled on the longest and shortest days of the year, but to also make some music of their own. Whether you sing a song, jam with a friend on guitar or listen to someone else make music, you will be participating in this special international celebration of music, the largest music festival in the world . Check back here to see who will be playing at the next Make Music Day. You can also visit Make Music Ossining Briarcliff on Facebook and download the Make Music Day free app from the app store. Happy Music Making! Check out some videos about Make Music Day here! Also, check out pictures below from some of our Make Music Day events courtesy of Gregory Perry Photography, our official Make Music Day photographer! Click here for a video of all the musical acts from Make Music Day Winter Solstice 2018! Click here for all the musical acts from Make Music Day Winter Solstice 2017. Click here for an episode of Pete's Garage all about Make Music Day Summer Solstice 2017. Jake and Jules at the Ossining Library Friends Corner. The "House Band" at Mark Seiden Real Estate Team. Mike and Miriam Risko at the Briars. 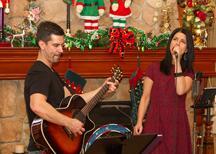 Music at Mark Seiden Real Estate Team. The Briarcliff Rotary Club Holiday lunch. 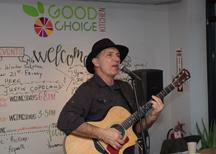 Joe Adami at Good Choice Kitchen. Jake and Jules at Village Hall. Mike and Miriam Risko at Mike Risko Music. 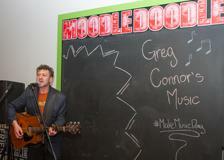 Greg Connors at 1st Village Coffee. Jake and Jules at Shine Salon. Buddy playing at the Wobble Cafe. Adam Love at Richard Wishnie Park. Phil Dollard at Six Degrees. Jules and Jake performed in front of Village Hall on Make Music Day 2016. Marcus Roman performed at Wobble Cafe on Make Music Day 2016. Robert Stava performed at Six Degrees of Separation Brewery on Make Music Day. Phil Dollard, another Make Music Day musician, came by to hear him play. Christina Picciano of All My Friends, performed for Make Music Day Summer and Winter 2016. 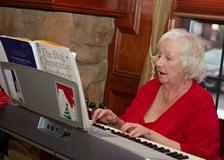 Both times she played at the Boathouse Restaurant in Ossining. Joe Adami also performed for both Summer and Winter. Here he is at Basta in Ossining. 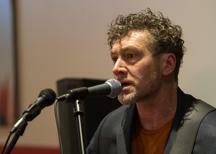 Phil Dollard performed at the Ossining Public Library on Make Music Day.